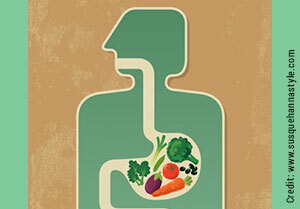 What makes for good digestion? Eating a variety of different foods every day and getting enough fluids is the best thing you can do for your digestion. Maintaining good digestion is important to reduce your risk of developing diverticular disease later in life, avoiding constipation, hemorrhoids and certain cancers such as cancers of the digestive tract. Good digestion is different for everyone, but generally it means going to the toilet once per day to pass a bowel motion and having a good appetite. When our digestion is not working so well, you will find that your energy will most probably be low, skin can be dull and your appetite may be poor. Going to the toilet several times a day or more is also not ideal as this may mean that nutrients are not being absorbed during digestion. It is important to see your doctor if you are having problems with your digestion as even though problems are usually dietary-related, more serious health problems need to be ruled out by a health care professional. An easy way to tell if you are well hydrated is the colour of your urine. If your urine is dark yellow, you are probably dehydrated, if it is light yellow or clear, you are most likely well hydrated. Fibre is the part of our food that is not digested that adds to the bulk of our bowel movements, and acts as the ‘glue’ that keeps it all together. There are two types, insoluble fibre that adds to the bulk, and soluble fibre that is the ‘glue’. It is important to have a good mix of both types of fibre in your diet. We need to aim to have between 25g and 30g of fibre each day. Good sources of soluble fibre are fruits and vegetables, oats, chickpeas, lentils and other dried legumes. Good sources of insoluble fibre are the skins of fruits and vegetables, nuts and seeds, wholegrain bread and cereals. *Don’t forget to increase your water at the same time! Exercise is important for bowel motility and if you find that your digestion is a little bit sluggish, you might find some benefit with a gentle walk each day or some exercises that stimulate the abdomen area.